Myelodysplastic syndromes are a group of cancers in which immature blood cells in the bone marrow do not mature or become healthy blood cells. 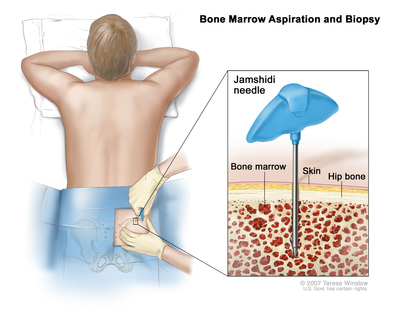 In a healthy person, the bone marrow makes blood stem cells (immature cells) that become mature blood cells over time. 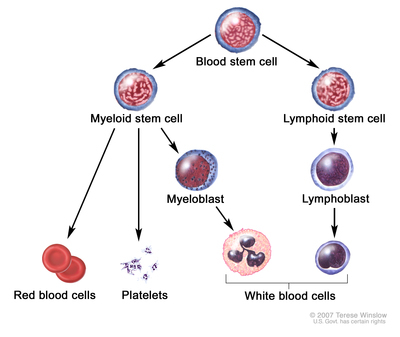 In a patient with a myelodysplastic syndrome, the blood stem cells (immature cells) do not become mature red blood cells, white blood cells, or platelets in the bone marrow. These immature blood cells, called blasts, do not work the way they should and either die in the bone marrow or soon after they go into the blood. This leaves less room for healthy white blood cells, red blood cells, and platelets to form in the bone marrow. When there are fewer healthy blood cells, infection, anemia, or easy bleeding may occur. The different types of myelodysplastic syndromes are diagnosed based on certain changes in the blood cells and bone marrow. Refractory anemia: There are too few red blood cells in the blood and the patient has anemia. The number of white blood cells and platelets is normal. Refractory anemia with ring sideroblasts: There are too few red blood cells in the blood and the patient has anemia. The red blood cells have too much iron inside the cell. The number of white blood cells and platelets is normal. Refractory anemia with excess blasts: There are too few red blood cells in the blood and the patient has anemia. Five percent to 19% of the cells in the bone marrow are blasts. There also may be changes to the white blood cells and platelets. Refractory anemia with excess blasts may progress to acute myeloid leukemia (AML). See the PDQ Adult Acute Myeloid Leukemia Treatment summary for more information. Refractory cytopenia with multilineage dysplasia: There are too few of at least two types of blood cells (red blood cells, platelets, or white blood cells). Less than 5% of the cells in the bone marrow are blasts and less than 1% of the cells in the blood are blasts. If red blood cells are affected, they may have extra iron. Refractory cytopenia may progress to acute myeloid leukemia (AML). Refractory cytopenia with unilineage dysplasia: There are too few of one type of blood cell (red blood cells, platelets, or white blood cells). There are changes in 10% or more of two other types of blood cells. Less than 5% of the cells in the bone marrow are blasts and less than 1% of the cells in the blood are blasts. Unclassifiable myelodysplastic syndrome: The numbers of blasts in the bone marrow and blood are normal, and the disease is not one of the other myelodysplastic syndromes. Myelodysplastic syndrome associated with an isolated del(5q) chromosome abnormality: There are too few red blood cells in the blood and the patient has anemia. 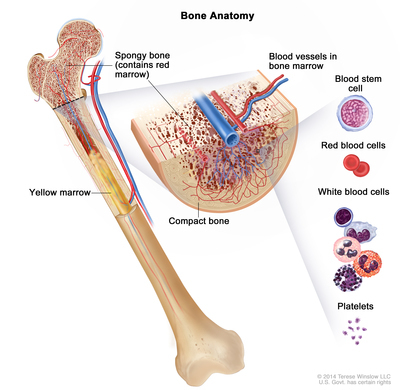 Less than 5% of the cells in the bone marrow and blood are blasts. There is a specific change in the chromosome. Chronic myelomonocytic leukemia (CMML): See the PDQ summary on Myelodysplastic/ Myeloproliferative Neoplasms Treatment for more information. Age and past treatment with chemotherapy or radiation therapy affect the risk of a myelodysplastic syndrome. Past treatment with chemotherapy or radiation therapy for cancer. Being exposed to certain chemicals, including tobacco smoke, pesticides, fertilizers, and solvents such as benzene. The cause of myelodysplastic syndromes in most patients is not known. Signs and symptoms of a myelodysplastic syndrome include shortness of breath and feeling tired. Having skin that is paler than usual. Tests that examine the blood and bone marrow are used to detect (find) and diagnose myelodysplastic syndromes. Peripheral blood smear: A procedure in which a sample of blood is checked for changes in the number, type, shape, and size of blood cells and for too much iron in the red blood cells. Cytogenetic analysis: A test in which cells in a sample of blood or bone marrow are viewed under a microscope to look for certain changes in the chromosomes. Blood chemistry studies: A procedure in which a blood sample is checked to measure the amounts of certain substances, such as vitamin B12 and folate, released into the blood by organs and tissues in the body. An unusual (higher or lower than normal) amount of a substance can be a sign of disease. Immunocytochemistry: A test that uses antibodies to check for certain antigens in a sample of bone marrow. 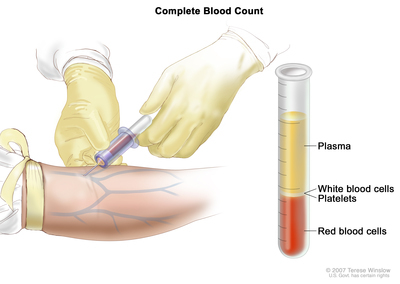 This type of test is used to tell the difference between myelodysplastic syndromes, leukemia, and other conditions. Immunophenotyping: A process used to identify cells, based on the types of antigens or markers on the surface of the cell. This process is used to diagnose specific types of leukemia and other blood disorders by comparing the cancer cells to normal cells of the immune system. Certain factors affect prognosis and treatment options. The number of blast cells in the bone marrow. Whether one or more types of blood cells are affected. Whether the patient has signs or symptoms of anemia, bleeding, or infection. Whether the patient has a low or high risk of leukemia. Whether the myelodysplastic syndrome occurred after chemotherapy or radiation therapy for cancer.